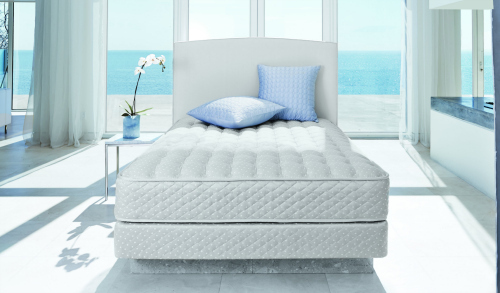 TORONTO – Canadian high-end specialist Marshall Mattress will launch its Sleepmaker Harmony collection of foam-free mattresses at the upcoming summer edition of the Las Vegas Market, which is set to open on Saturday, 29 July for a five-day run. Marshall is located in Building B of the World Market Center, space 922. “We recognise that there is a distinct group of consumers looking for foam-free mattress solutions either because of sensitivities, allergies or personal preference.” Bradley Warner, president and managing partner of Marshall Mattress said in a statement. Sleepmaker Harmony is a collection of pocket coil mattresses that incorporates a new and resilient fibre upholstery blend which forgoes the use of traditional foam materials. When combined with the underlying pocket coil spring system, the result is great comfort and pressure-relieving support. Earlier this year, Marshall Mattress introduced a five-model Bespoke by Marshall collection featuring a hand-tufted style characteristic of the turn of the 20th century. These models incorporate Eucalyptus-Lyocell fibre, New Zealand wool, cotton and natural latex, along with the Marshall Mattress patented, cotton-wrapped pocket spring system, to provide luxurious comfort and temperature-ambience that is ideal for restful sleep. Select models of the Bespoke by Marshall Collection will also be available for viewing at this summer’s Last Vegas Market. Warner noted all Marshall Mattress products are handcrafted without foam encasement or gels and use the best natural and new manmade materials in their manufacture.